In a shifting economy without any assurances of success, there's a lot of pressure on students to succeed in school. More and more kids are going to college and the application process is competitive. To help stand out, students are taking on tougher course loads, along with extracurricular activities and leadership roles. In order to pack everything in, some kids turn to prescription drugs like Adderall and Ritalin to stay awake and focus on school work and test prep. They can obtain the medication from doctors, peers and sources they find online. However, many of these students, both in high school and in college, don’t know the physical or neurological ramifications of taking drugs that haven’t been prescribed to them by a doctor. “We live in this culture of excellence,” said Michael McCutcheon, a counseling psychology phD candidate at New York University, on KQED’s Forum, “and if you are at a competitive high school and you know the culture really only celebrates success or money, then everything is riding on this test.” That overwhelming pressure – the feeling that every test and grade matters for ones future – combined with ease of access to these drugs makes their use seductive. Stanford Graduate School of Education senior lecturer Denise Pope found similar experiences among thousands of high school students she has interviewed or observed in her work. “These kids are completely overloaded,” Pope said. “They come from high achieving schools, but these kids feel like there’s more homework than there is time in a day.” She cited increased pressure to take Advanced Placement or honors classes that require lots of homework, along with the explosion of extracurricular activities and the time students devote to them as some of the reasons for increased stress. Indeed, study drugs are most often used by high achieving high school students and among college student-athletes and those who participate in the Greek system. A 2009 review of the literature on study drugs found that anywhere between five and nine percent of middle and high school students, and five to 35 percent of college students use prescription drugs to stay awake and focus longer than they would normally. Drugs like Adderall and Ritalin are prescribed to kids with Attention Deficit Disorder (ADD) or Attention Deficit Hyperactivity Disorder (ADHD). These kids are easily distracted by visual or auditory background noises, which can overwhelm them and make it hard to focus. People with ADD or ADHD don’t produce enough dopamine in the brain, which the drugs help correct. For kids who actually need Adderall or Ritalin, the brain’s dopamine pathways aren’t strong enough to circulate the neural signals that make certain mental processes go. For those kids the added dopamine can have a huge influence on ability to focus, but also comes with some less desirable side effects when the drug wears off like fatigue, depression and mood-swings. There’s a lot less known about how the drug affects brains that start out with normal dopamine levels because clinicians consider it too risky to conduct a study that would subject “normal” students to the drug. “The question is do they really help normal people with learning,” Goldsmith said, “There hasn’t been any reason to study them because the risks are so significant.” Those risks include depression, psychosis, mood swings, suicidal thoughts, seizures, decreased appetite and insomnia. DO STUDY DRUGS IMPROVE LEARNING? Students certainly think so, but they may be misjudging the quality of their performance when taking study drugs. 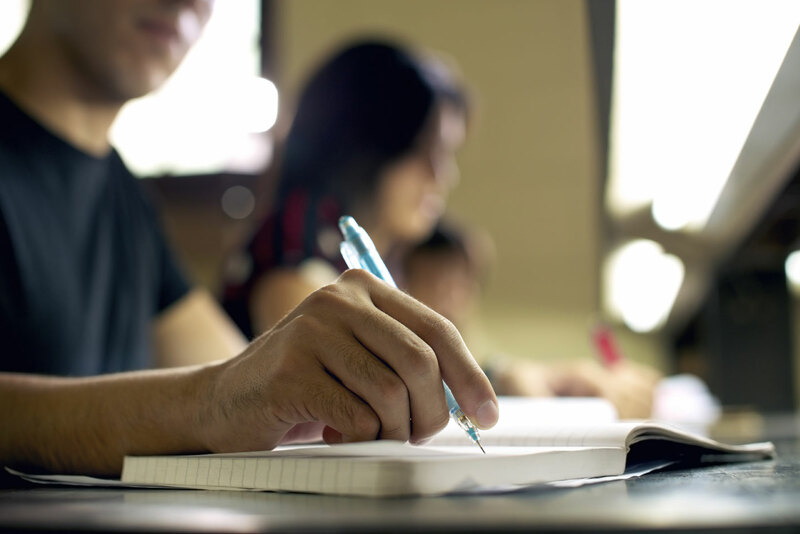 “Students who are misusing are actually more likely to have a lower grade point average,” said Niloofar Bavarian, assistant professor in the Health Science Department at California State University, Long Beach. Bavarian conducted a study of 554 UC Berkeley undergraduates and found about 17 percent of those surveyed were misusing prescription stimulants. While the drugs may help students stay awake to study, research shows they don’t enhance brain functioning. Hurriedly done work still looks like rushed work. “There are a lot of things that make up learning and there are some small studies with adults that show improvement in working memory, but it’s shown not to be helpful for long term memory and assimilation,” Goldsmith said. She’s also quick to point out that other studies contradict those showing improved short-term memory. “There are studies that counter each other,” she said. “Some show a positive result in this very small aspect of learning and others showed impairment.” It all depends on the dose a person takes, the individual brain, and any knowledge brought to the table. In other words, the drugs might help a student stay awake to cram information into short-term memory for a test, but it’s not helping them truly learn the material. And the drugs could prevent students from doing important things for brain health, like sleeping and eating. The adults in students' lives play a big role in how much stress they experience. A balanced life that includes strong time management skills, at least 9.5 hours of sleep per night and a moderate number of extracurricular commitments can help students feel like their lives are manageable. In some cases, students feel they have to keep up with their peers and can’t imagine doing so without the aid of stimulants. Denise Pope notes that she hears the same thing from the high school students she studies. They don’t want to take study drugs, but they feel that they have to in order to keep up. So, how can parents and teachers reduce stress on the teens and young adults in their lives? One way is stop confusing rigor with workload. Pope said she knows one high school Advanced Placement teacher who cut the homework load in half and didn't see any change in students’ AP scores. “If you look at the protective factors for kids it’s very clear that every kid needs play time, down time and family time,” Pope said. She’s also found that genuine motivation and engagement with school decreases stress and academic anxiety. Many kids want to meet the high expectations of their teachers and parents, but may not be able to handle the stress of taking all advanced courses with heavy homework loads and participate in multiple extracurricular activities. Adults need to help model healthy schedules and make students see it’s okay to be a kid too.